Reuben is currently working on an exciting new project in collaboration with a London based software developer Zuztertu. Zuztertu Ltd specialise in producing educational apps for the iPhone, iPod Touch & iPad. Reuben is in the process of writing the text and diagrams, and composing audio examples for a series of five interactive book-style apps on the “theory of music.” These easy to read products feature visual, auditory and kinaesthetic learning methods to help musicians better understand how to read music with support to help prepare for theory exams (follows ABRSM theory syllabus). A great way to learn on the go, these apps provide clear, logical instruction as well as fun games and activities to reinforce the concepts. The first app is available world-wide now by clicking the link below and the second app is due for release soon. 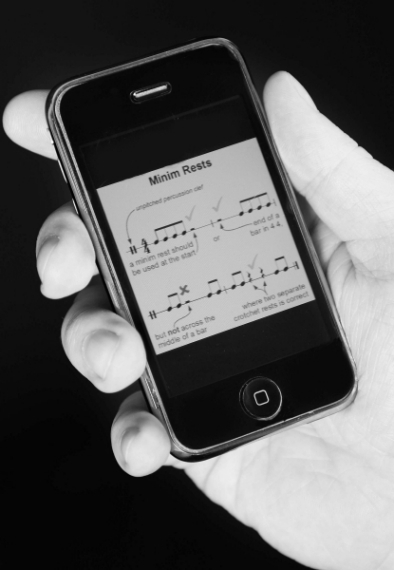 An exciting new way to learn the theory of music all in the convenience of your pocket. Good theory knowledge will help you perform music quicker and easier and it will help you make up your own songs. Learn by listening to the text being spoken whilst you read along to the short, easy to understand topics. Enjoy hearing the music come to life as you listen to the interactive diagrams and music. And then have fun revising what you’ve learnt through a variety of learning games. Learning music theory has never been so much fun!! !